A few weeks ago, a reader left a comment asking about what it looked like behind the scenes. This is what it looks like when you take 5 steps back. On a good day. On a more normal day, there are a gajillion toys on the floor in the background and a toddler trying to climb on the table to get at the goods. She’s either screeching with excitement about the thought of sinking her hand into a bowl of guacamole or she’s… just screeching. Taking a picture for the blog goes down pretty quickly. It has to. I try to work during naptime. I get the brightest light in the living room and all screeching toddlers are quietly sleeping upstairs. – I decide which of the four DIY tabletops surfaces look the best with the dish (you can probably tell I’m partial to the blue & white ones). – I go through my box of misfit dishes, thrift store flatware, and remnant bin fabrics and assemble some supporting characters. – After arranging the shot on the tabletop in the kitchen, I carry the whole thing to the coffee table in the living room and drag the table over to the window. The tabletops are about 2ft x 2ft. Some shots work better landscape, others portrait. The decision to shoot straight-on, 3/4, or overhead sometimes takes a couple of minutes to decide but I usually know what I’m going to do when I’m arranging things in the kitchen. I’ve been using the same $2 foam core board for… 4 years? And it shows. It bounces the light back onto the shot to fill in the shadows. Because I like “girly light.” And shadows are evil in “girly light” 🙂 I also have black poster board that kills the glare. The clamps came from the garage. They were initially purchased for a DIY poker table project 6 years ago. (6 years!) I can always use an extra set of hands, but when he’s at the office, the clamps will do. When I shoot back-lit (like this shot), I use the clamps to hold a cheap white sheet onto the curtains to diffuse the light. The tripod in the background wasn’t used for this shot. I use it in low-light situations so I can slow the shutter speed way down. When I use the tripod, I usually shoot tethered – my camera is connected via USB cable to my laptop and I pull the trigger in Lightroom. I have both hands free to clean up the shot and move things around. And usually I can see right away when I’ve accidentally included the toe of my show in the photo. Or the eggshell I decided not to use but forgot and left it in the shot anyway. I love seeing how other people set up their shots. Yours are wonderful so thank you for sharing! Your window set-up looks perfect. Great post! Thanks for all the useful tips and help! Very interesting! Thank you so much for sharing!!! Thanks for the “behind the scenes” look, your photos are so inspiring! Hi, this is a fab post, always cool to have a behind the scene shot! Could you do a post on how you made the tabletops please? I was going to ask the same question. Looking forward to that post! Thanks so much for this little peak! Thanks for sharing how you set-up your photos! I learn so much from what others are willing to share and truly appreciate it! this is great! i always look at specifically at the table top for some reason…and wonder how all these people have such neat tables/counters…duh! build your own! A post on how you did the table tops would be fantastic! Like Abby, I always wonder how people have such great surfaces to shoot on. This is a great tip! Great post! You always have the best pictures. I think I’m going to borrow your foam idea, thanks! I’m always amazed by what other food bloggers can accomplish and enjoy seeing how they do it. Such a great post – thanks for sharing! Your pictures are so inspiring. Thanks for sharing a bit about what goes into them. I’m not sure if you’ve ever done a post about that, but do you have any tips on the styling part? Once in a while I get it right but usually I’m totally lost! Love seeing your set up! And glad to know I’m not the only one to experience the screeching toddler too, haha. Thank you, this is so interesting. 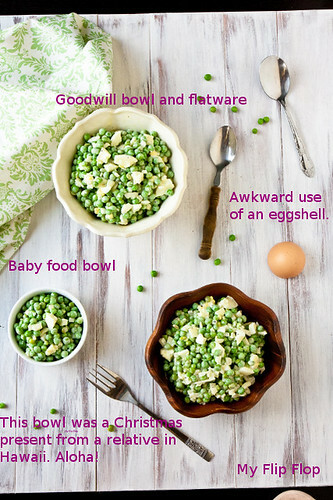 I’m starting to add more recipes to my mostly baby blog and this is very good info to have. Can you tell us how you use the black board to cut the glare? I constantly find myself in a battle between bright glaring light that washes things out and underexposure…thanks!!! Love this post! I love seeing how other people shoot their food photos and it’s always great how there’s so much more to the photo than the final product. When I take mine, instead of a cute baby, there’s a big doggy snout sniffing away. Thanks for sharing a little behind-the-scenes look. I’m always curious to see how other people work. You do a great job! This is great. When I first started blogging I just figured every blogger had white counters and special tables lol. I think it also shows how much effort you really put into every post. It isn’t just the baking/cooking it’s the set up, the picture taking, editing and finally the blogging. What a cool post! Thank you for sharing a peek into the inner workings of your beautiful photos! Thanks for sharing Shawnda! I took your advice and used a white posterboard to bounce light back onto the object I was shooting – it made great use of what little natural light was coming through my dining room window. Also, the DIY tabletops, what material do you cover them with? Thanks again for sharing! I was the reader who requested this post. I was SO excited when I saw it come across my GR. Thanks for indulging my curiosity- you rock! 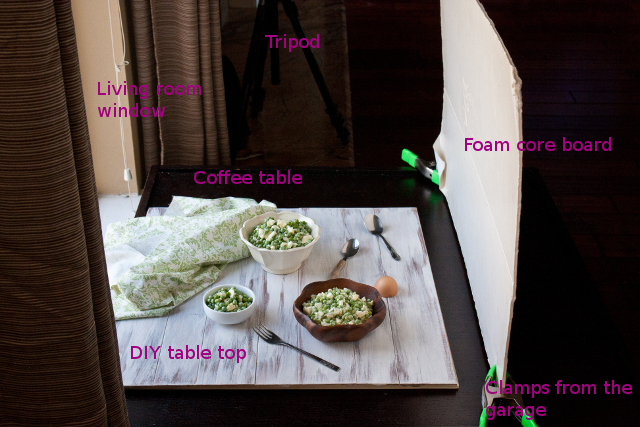 My set up is something like this, except I use a toy bin to hold up whatever cloth I am using as the backdrop, and it’s on my dining room table! And yup, I work during naptime too! Thanks so much! This is great. I agree with the others who would like a post on the diy tabletops. Thanks for sharing!! I am a complete dope, never imagined that there was this much behind-the-scenes action. I’m looking forward to trying some of this out. 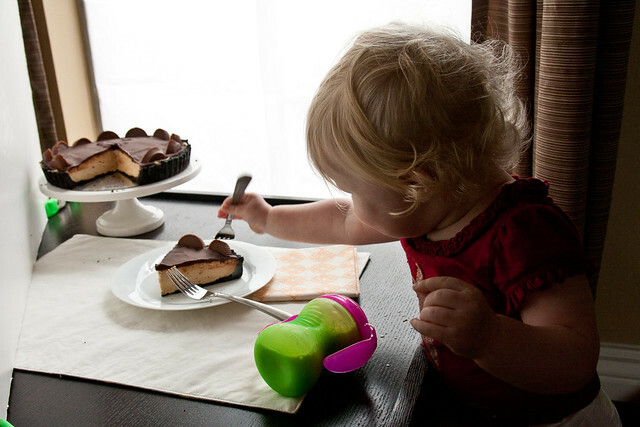 Love the shot of foodie baby stealing some chocolate peanut butter pie! This post made me smile – sounds like my house. My photo shoots are limited to Saturday and/or Sunday, when the husband is at the gym and the baby is taking a nap. The baby isn’t walking yet, so I don’t have to worry just now about him sticking a little finger into the middle of my rapidly melting frozen dessert. However, I do have a curious cat that frequently likes to crash my scene. Wow thanks for the post. Its so interesting to see the behind the scenes info ! Thanks for sharing. Photography is NOT a talent i have so i really appreciate those that do ! do you have anything over the window? If there’s direct sunlight, yes. I’ll tape a piece of white tissue paper (the gift wrap kind) on the window.